High Country Artisans, Inc.’s intent is to promote quality craftsmen and artists in the region through exhibitions and demonstrations and to support art programs in the community. Our purposes are exclusively charitable and cultural. 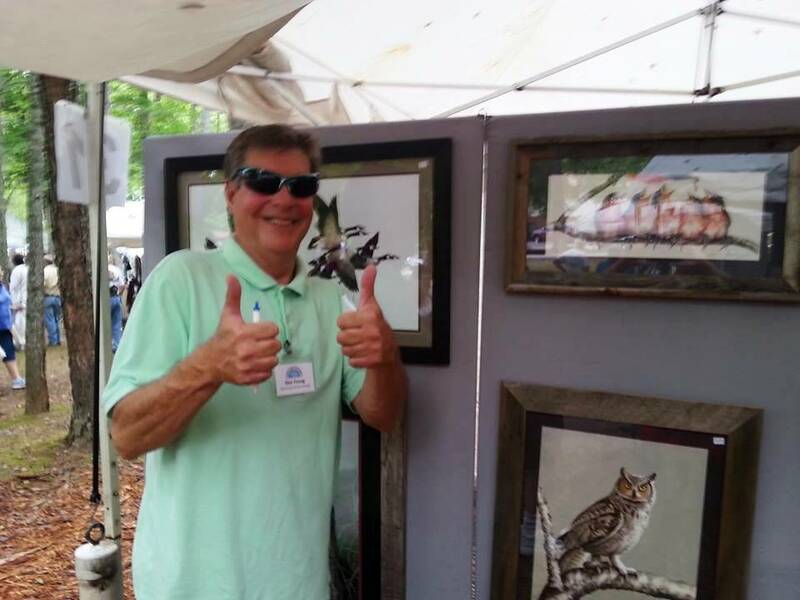 Our commitment is to promote, improve and expand functional and visual arts for everyone in the North Georgia Mountains and to conserve and enhance the rich heritage of all areas of traditional arts & crafts by encouraging a wider appreciation of these arts & crafts. 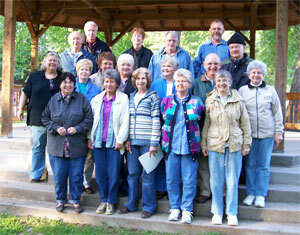 High Country Artisans, Inc. is an all-volunteer non-profit 501(c)(3) organization with no paid staff. Membership is open to anyone who has a love and appreciation of the arts. High Country Artisans meet on the 3rd Monday of the month @ 6:30 pm in the United Community Bank Community Room on Hwy 515 east in Blairsville, GA. May meeting held at Meeks Park. All meetings start with a covered dish potluck supper. Once upon a dream – Judy, a talented decorative painter, Mike, a master wood craftsman, and Suzanne, a stained glass artist, dreamed an impossible dream. Having participated in arts and crafts shows throughout the Southeast for several years, they had experienced numerous poorly organized and badly run shows, but only rarely, had they been privileged to encounter what they considered to be a quality arts and crafts festival. In 1997 these 3 individuals formed the High Country Artisans, Inc. to promote quality art work in the North Georgia Mountains. Their major activity would be their version of a well organized, well run, well attended, quality arts and crafts festival named “The Butternut Creek Festival”. In their vision, such a festival would require a beautiful natural setting offering shade and comfort for the visitors, careful jury screening of all exhibitors to insure a balanced show of multiple artistic categories (with only the best in each category), limiting the total number of exhibitors to 60-70 to insure each exhibitor a reasonable chance for successful sales, reasonable exhibitor fees, live musical entertainment featuring crowd pleasing music, free admission and free parking for all visitors, active local community support, a few good food vendors, adequate night security, and lots of media publicity. 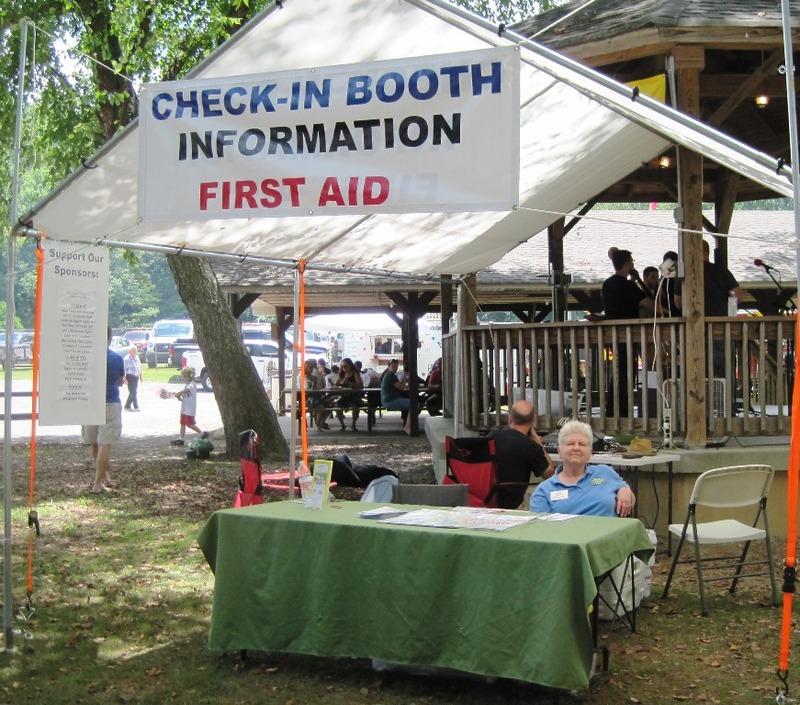 Finally, the entire operation should be run solely by volunteers, so that all show proceeds could be used to improve the festival operations or to benefit the local community. With these goals in mind, they organized the first Butternut Creek Festival in 1998.They discovered their ideal festival setting in Meeks Park, a fully functional community park operated by the Union County Recreation Department. A major part of the park was a beautiful, nearly level, area along the banks of the Butternut Creek which featured lots of stately shade trees. In addition, there was a large picnic pavilion where the musical performers could be located. Both the Blairsville/Union County Chamber of Commerce and the Recreation Department became major supporters of the festival. The first festival came and went and a lot was learned from that first experience. The next year, necessary changes and adjustments were made. Gradually the festival began to grow in quality, size and attendance. The community base expanded as additional major sponsors joined, foremost being United Community Bank. In conjunction with the Recreation Department, the Festival funded the construction of a new Performing Gazebo in the exhibitor area prior to the 2006 Festival. In 2007, the Ninth Annual Butternut Creek Festival was the largest ever with over 8,000 visitors in the Park on Saturday. With strong active support from the Recreation Department, 2 shuttles were activated to assist in moving people between the parking and exhibitor areas. On July 17, 2008, Union County Commissioner Lamar Paris signed a proclamation recognizing Butternut Creek Festival and it's founding members. The Butternut Creek Festival also celebrated its 10th Anniversary at the 2008 festival with birthday cake, coffee, and doughnuts. 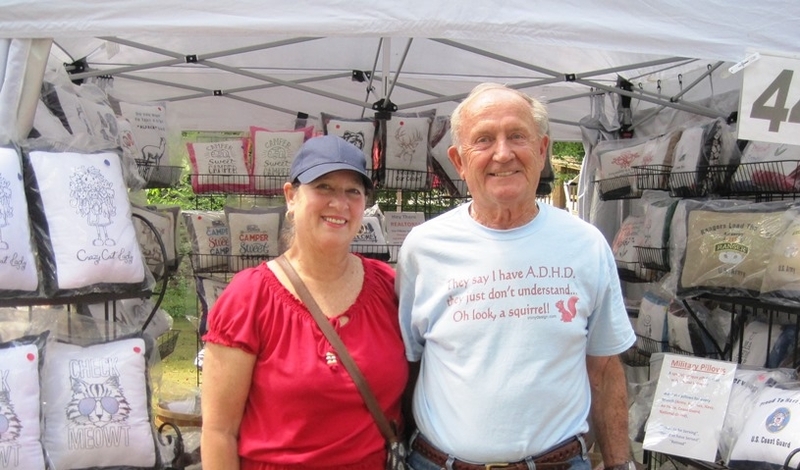 Artists, craftsmen, and other vendors gathered on Sunday morning for the special occasion. It was a time of celebrating the realization of a dream. If you dream big, work hard, and have dedicated supporters, you can truly achieve the impossible. High Country Artisans presents check to principal of Woody Gap School in Suches for Art Supplies in 2015. Left to right: Carol Demme, Paul Grossmann, Bob Scoda, Co-Principal Sheila Collins, Robin Bird Smith, Brenda Chambers, Tom Chambers, Linda Karmgard and Mary Lengnick. Putting up banners for 20th Annual Butternut Creek Festival. Duncan Sickler, Tom Chambers, Paul & Helena Grossmann. Presentation in 2017 to Sylvia Garner, Union County Middle School Art Teacher. 2017 Presentation to Woody Gap School, Suches, GA. for art supplies. Left to right Helena Grossmann, Bob Scoda, Co Principals, Carol Knight and Sheila Collins, Paul Grossmann, Robin Bird Smith, Linda Karmgard and Brenda Chambers. 2018 Checks in support of the Art Programs at Union County Middles School and Woody Gap School, presented by the High County Artisans. 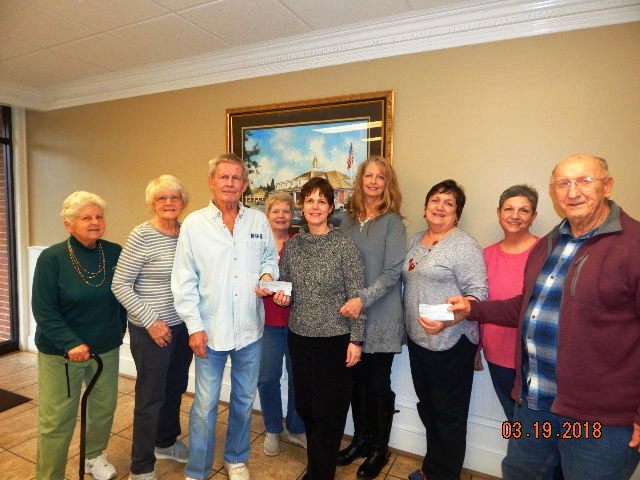 Left to right: Madeline Scoda, Helena Grossmann, Paul Grossmann, Linda Karmgard, Co Principals of Woody Gap School, Carol Knight and Sheila Collins, Union County Middle School art teacher Sylvia Garner, Brenda Chambers and Bob Scoda.